At the top of Finnish Lapland is the little village of Menesjärvi where locals herd reindeer and the winter sky blazes with the fire of the Northern Lights. Right in the middle of a group of shimmering lakes with ice thick enough to cross on dogsled, irresistibly remote and disconnected from any conventional tourist hotspot, it’s a breath-taking family destination in every sense of the phrase. Get together and take it all in. Half an hour away is Inari, the region’s cultural centre. Here you can learn all about the life and history of the Sami, the indigenous people of the Nordic countries. Pay a visit to the Sami Museum Siida: far from being a stuffy collection of exhibits, it’s a colourful and informative location to see, helping everyone appreciate a rich and profound heritage. Your holiday home in Menesjärvi will be the Hotel ‘Korpikartano’: the ‘mansion in the wilderness’, as its name translates. A traditional welcome from its kind owners is always guaranteed, and its simple wooden rooms come in a variety of homely shapes and sizes – just the place to unwind after fun on the snow! Familiarise yourselves with the stunning surroundings of Menesjärvi by snowshoeing around the area. Trek past pretty lakes and calm forests – better still, prepare to pick up the ways of the wilderness with guided outdoor skills sessions! You’ll be schooled in the arts of map-work, reading animal tracks, and starting a campfire. We’ll make true explorers out of the whole family! You can then up the speed by hopping on a snowmobile and tackling an outdoor trail before stopping off to try your hand at winter fishing on an icy lake – it’s so fulfilling to reel something in! You can also go kick-sledding and cross-country skiing on nearby slopes; in all cases, you’ll be fully taught how to use the equipment. On top of visiting the Siida Museum, it will be possible to spend a day at a reindeer farm and feed these friendly creatures while finding out about their importance in Sami life. The other major local attraction is undoubtedly the Northern Lights, and you’ll be able to go looking for them at different viewpoints. Did you know that Finns have their main Christmas celebrations on Christmas Eve? Our Menesjärvi holiday at this time will get you joining in with a spectacular gala dinner to fill the evening. On New Year’s Eve, there will be a feast in a Sami kota, or traditional tent – an incredibly atmospheric experience! Book our ‘Family Northern Lights Hunt at New Year’ and you’ll also have the chance to spend the night in Helsinki, with a bargain ‘Helsinki Card’ granting you free access to the Finnair City Bus and a range of landmarks. Our favourite activity on our Menesjärvi holidays has to be the wilderness skills sessions. The expert guiding you through everything is the Finnish equivalent of Ray Mears and has you trained up in no time. This is not something you’ll be able to try out back home, so make the most of it! 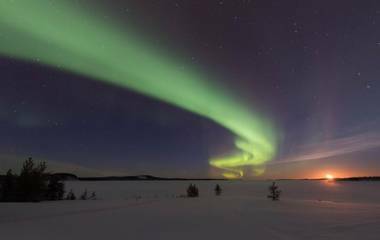 You might not think that anything could make watching the Northern Lights even more wonderful than it already is, but having a workshop to take you through the Sami myths and legends associated with the Aurora Borealis, as well as the science that explains how they work, makes your viewing all the more valuable. You’ll also receive handy tips on how best to capture them on camera, leaving you with high quality, professional-looking memories. Staying over in Helsinki is a nice little addition to your holiday (and a sneaky way to get two destinations into one!). There’s a fantastic food scene in this booming capital, so we suggest tucking in at one of its stylish restaurants and roaming around its vibrant waterfront market.